Speaking of Sephora clearance, these are currently knocked down to half price. I've been liking the Sephora + PANTONE UNIVERSE releases as they seem to be pretty heavy on the duochromes. Duocrome shadows, lipglosses and polishes? Right up my alley. So, how about these? 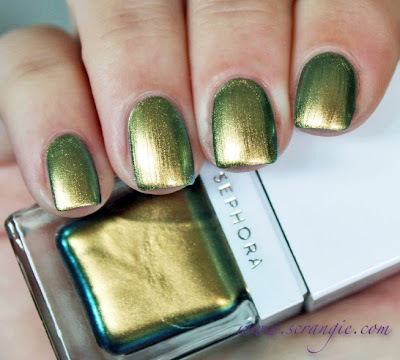 Sephora + PANTONE UNIVERSE Antique Gold. Green/yellow/blue chrome-finish multichrome. 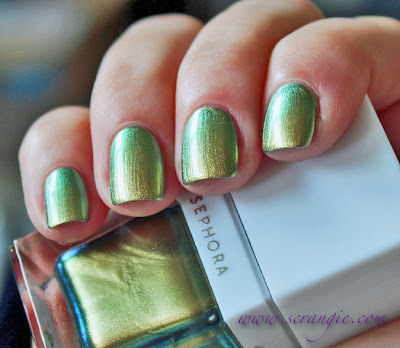 Chanel Peridot clone. 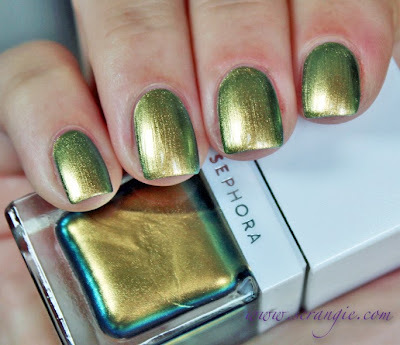 Thinner, sheerer, and less duochrome effect than Peridot (and Sephora by OPI Sage is Just A Number). Sephora + PANTONE UNIVERSE Purple Wine. 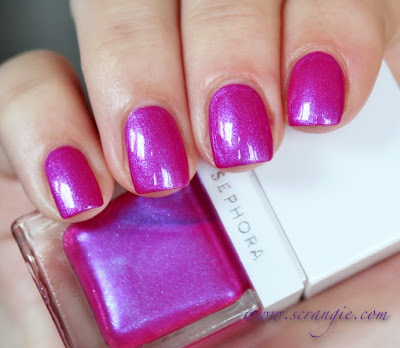 Near-neon fuchsia-purple creme base with superfine silver, violet and blue duochrome shimmer. Best one in the set, in my opinion. 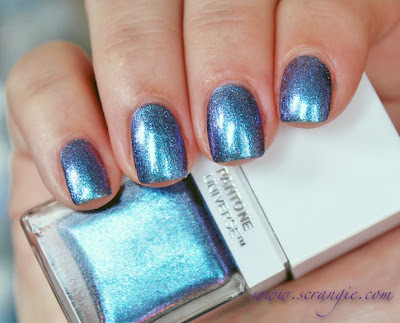 Good balance of bright, flashy color and electric-looking duochrome shimmer. Best formula of the three as well. 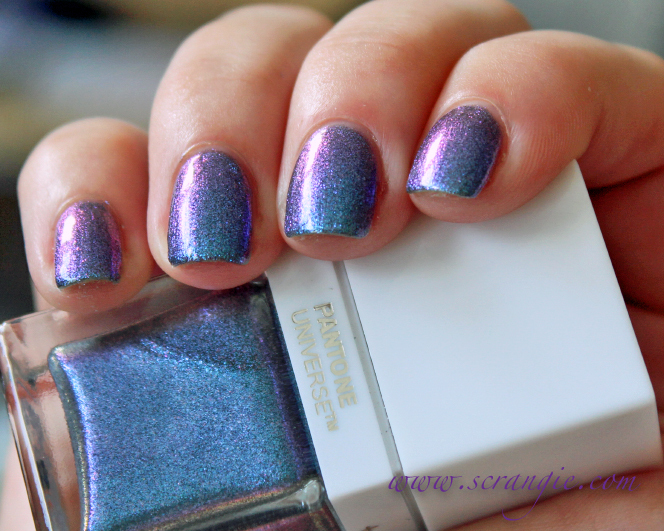 Sephora + PANTONE UNIVERSE Waterfall. Dusty slate blue glass-fleck with blue, purple and pink multichrome flash. It looks decent in the pictures, but I wasn't impressed with it on my nails. It's faded and dusty-looking and extremely sheer. This is five coats. 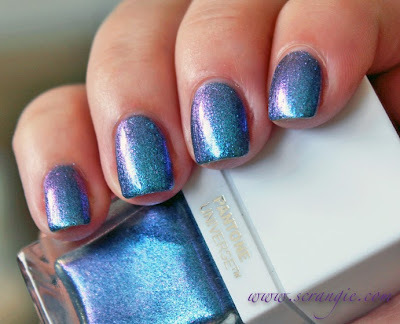 Unless you don't mind layering over an opaque base color (or doing five coats of polish), I'd say pass on this one. The formula on these was different for each color. 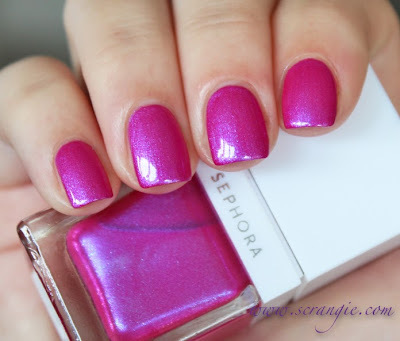 Purple Wine was perfect and flawless in regards to coverage and application. Antique Gold was streaky and on the sheer side. Waterfall was extremely sheer and kinda clumpy. Dry time on all three was fast, and all but Antique Gold look better with topcoat. The bottles are pretty cool and the colors are pretty, but one is a definite dupe and one is super sheer. But, like I mentioned, they are on clearance right now for $5 each, so they're not too expensive even if the opacity level isn't perfect. Purple Wine is great in both the color and formula departments at least! Purple wine is definitely my favorite, it's gorgeous! Purple Wine and Waterfall look gorgeous! I'm so tired of all the Peridot dupes, though. Waterfall looks beautiful! I'd love to give these a go! Thanks for the review! Love the first and third one! UAU amei aquele verde *. * Divino!